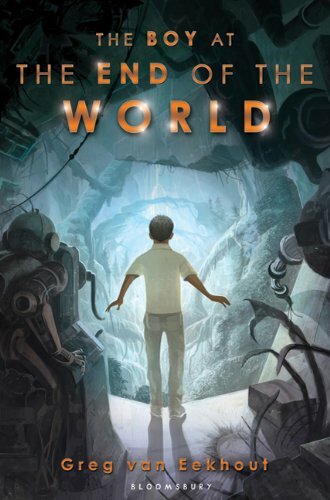 The first two chapters of upcoming middle grade science fiction novel The Boy at the End of the World is out on the web. Author Greg van Eekhout writes for Tor on occasion, and he was excited about this sampling of his book, which is due out today, June 21st. The excerpt is below! Fisher is the last boy on earth—and things are not looking good for the human race. Only Fisher made it out alive after the carefully crafted survival bunker where Fisher and dozens of other humans had been sleeping was destroyed. Luckily, Fisher is not totally alone. He meets a broken robot he names Click, whose programmed purpose—to help Fisher “continue existing”—makes it act an awful lot like an overprotective parent. Together, Fisher and Click uncover evidence that there may be a second survival bunker far to the west. In prose that skips from hilarious to touching and back in a heartbeat, Greg van Eekhout brings us a thrilling story of survival that becomes a journey to a new hope—if Fisher can continue existing long enough to get there. Fisher became born in a pod filled with bubbling gel. A plastic umbilical cord snaked from his belly. When he opened his eyes, the first thing he saw through the clear lid of the pod was destruction. Slabs of concrete and twisted steel fell to the floor amid clouds of dust. Severed wires spit sparks into the air. The world was coming apart. Something told Fisher to get up, get out, run away while he still could. The world instinct came to mind. He pushed against the pod lid and it came open with a hiss. The gel stopped bubbling and drained away through holes at the bottom of the pod. Cold air struck Fisher’s wet skin when he sat up. It was the first time he’d ever been cold, and he hated it. He’d made a mistake. He never should have opened the lid. He never should have made himself become born. Maybe if he just lay back down and closed the lid the gel would return and he could go back to sleep and he’d be warm and everything would be all right. A huge, explosive thud hammered Fisher’s ears. The ground shook and the dim lights in the ceiling wavered and died. It was some kind of disaster. Or an attack. Fisher didn’t know anything about attacks, except they were dangerous and should be avoided. Pipes clanged against the floor and more debris rained down. More sparks, more dust. Bitter air stung his nostrils. Fisher had never smelled this smell before. In fact, it was pretty much the first thing he’d ever smelled. He was only a few moments old, after all, and hadn’t had time to smell much. Somehow, though, he knew the smell meant things were burning around him. There was no choice now. He had to make himself all the way born and get out of whatever this place was before everything burned and crashed around him. He swung his legs over the side of the pod and set his bare feet down on the cold floor. He took a step, and then another, and that was as far as he got. The umbilical tugged him back. It was still attached to his belly. He would have to yank it out if he was going to become all the way born. But there was just no way he could do that. He knew this wasn’t how things were supposed to be. His birth was supposed to be soft. He was supposed to be soothed and bathed in light. He wasn’t supposed to be alone. Another shuddering whomp, and Fisher’s ears popped. It felt like something massive had struck the building. Debris clattered down. A big chunk of ceiling fell right in front of him, and Fisher discovered another thing he knew: Profanity. Profanity was a collection of words that helped express strong feelings. Fisher uttered a word from his profanity collection now. It was the first word he ever spoke. If the ceiling chunk had struck his head, Fisher would have been dead. Over and done with. He couldn’t accept the idea of dying before he’d even become fully born, so he wrapped his fingers around his plastic umbilical and gave it a mighty yank. The cord came out, spraying milky fluid and a little bit of blood, and Fisher bawled because now he was completely born and he knew there’d be no going back. But he didn’t bawl standing still. He bawled while running and shouting profanity. Fisher found more pods lining the walls of vast, caved-in rooms. The pods contained all kinds of animals. In one room, the pods held dogs. In another, pigs. In yet another, goats. One room was full of pods the size of his hand, thousands of them, and inside were bees and worms and butterflies. Another room held only four pods, each many times the size of Fisher’s own. Inside were elephants, their eyes shut, their curving tusks tinted blue through the gel. All the pods were broken. The lights were out. The gel didn’t bubble. Many were cracked, their gel oozing to the ground. And many more were completely crushed by fallen debris. Fisher knew what death was. He had become born knowing. Death was failure. All the creatures in these pods had failed to survive. He came to one last chamber, stretching into the smoky distance, where the pods were smashed and buried. From a mound of rubble emerged a slender brown arm. A human arm. Fisher silently approached it. He brushed pebbles and dust from the damp fingers and touched the wrist. A noise drew Fisher’s attention away from the dead human. Down the corridor, through a haze of powdery light, a creature was bent over another pod. The creature was a little larger than Fisher and roughly shaped like him: two arms and two legs, a torso, an oval head. It was shaped like a human, but clearly not a human. A machine of some kind. The word robot came to Fisher’s mind. The pod had been knocked partway off its support platform, and the dead human inside dangled out of it. The creature was doing something with the dead human’s umbilical cord. Fisher’s breath quickened with fear. He pressed his lips together to keep from making a noise and took a slow step back, then another. His heel struck a fallen pipe, and losing his balance, he went down hard. The human-but-not-human creature’s head snapped around, turning its human-but-not-human face to Fisher. Fisher ran. He scrambled over shattered puzzle pieces of concrete, though lung-choking smoke, through rooms where flames licked at pods of dead fish. He found a shaft of chalky light from above and began climbing up a steep slope of debris. Loose bits of concrete slid away beneath his hands and feet, and he struggled not to go sliding with them. Behind him, he could hear the screechy movements of the creature that knew his name, but the sounds grew fainter the higher up he climbed. He kept going until, at last, he stumbled out into moonlight. He took a moment to understand his surroundings. Creatures could kill him, but so could his environment. He knew this in the same way he knew his name and knew profanity and knew what kinds of animals lay dead in their pods. He was on the summit of a mountain formed from colossal slabs of granite. There were no buildings in sight. Scant patches of trees smoldered and smoked. Soil and rocks tumbled from collapsing ledges. He couldn’t tell exactly what had just happened here, but he had a strong sense that the place of his birth had just been attacked from above. How, or by what, he couldn’t say. And, actually, he didn’t care. But now? He just wanted to get away. He took off in a jog down the mountain, his eyes never straying for long from the star-freckled night sky. As he descended, the way grew thicker with trees and ferns. Things rustled in the dark. Tiny eyes glinted with pinprick light from the high tree boughs. Hints of old structures in the woods revealed themselves. There were small piles of concrete bricks, and crumbling sections of walls. Anything could be hiding among them. The word predator came to Fisher’s mind. Predators were animals that used weaker animals as food. The eyes in the dark might belong to predators. The non-human creature down in the ruined birthing structure might be a predator. To deal with predators, Fisher would have to make sure he was always the strongest animal. He needed a weapon. Keeping watch for approaching predators, he crept up to the remains of a building. There was just a mostly-fallen wall, overgrown with ferns and vines. From a jagged concrete slab protruded a thin steel rod, sticking straight up. It flaked with rust. Fisher planted his foot against the concrete and grasped the rod with both hands. He bent it back, and then forward, and then back again, and continued like that until the rod snapped. The end was a jagged point of sharp nastiness. Fisher knew what a spear was. Now he had one. How had he known what a spear was? How had he known how to fashion one? His hands appeared to know things he didn’t quite know himself. For instance, they knew how to build a fire. Fisher could almost feel his fingers clutching tinder. Dry grass made good tinder. Or bark. Or leaves. Or tree resin. If he had tinder, then he’d need a way to ignite a fire. He could use flint sparks, or sunlight focused through a lens, or wood sticks and a small bow. Once the tinder was lit, he would need kindling to keep the fire going. There were plenty of branches around to use as kindling. Fisher wished he could build a fire now. Sticky gel and clammy sweat coated his skin. It was bad to sweat in the cold. He discovered he knew the wordhypothermia. But now was not the time or place for a fire. A fire might keep predators away, but it might also signal his presence to things. Things like the non-human creature. Better to get more distance from his birthing place. A twig snapped behind him. Fisher spun around. It reached for him with a soot-stained hand. Fisher used profanity and thrust his spear into the non-human creature’s chest. The mechanical creature’s face was a hideous mask. Two yellow globes bulged where eyes should have been. In place of a nose were a pair of vertical slits. Its mouth was an ear-to-ear chasm covered by fine wire mesh. Red wires poked from a small crack in its head. Maybe a rock had fallen on it during the attack. Fisher wished it had been a larger rock. The mechanical man grabbed the spear with both hands and slowly withdrew it from his chest. The shaft was smeared with oil. “What do you want?” Fisher said, ready to make another spear thrust. This time he’d aim for the machine’s cracked skull. Not what Fisher expected. He figured the machine wanted to kill him. Tear his head off. Eat his brains and guts as mechanical-man fuel. Fisher didn’t know what most of those words meant, and definitely not in that order. He decided the safest thing to do was kill the mechanical man. Just as he prepared to spring, the machine’s head swiveled around. “We are in imminent danger,” he said. More profanity almost shot from Fisher’s mouth, but words froze on his tongue. Creeping up behind the mechanical man, at least two-dozen pairs of little glowing eyes approached. They belonged to creatures about four feet long, sleek and brown-furred with pink paws and slender, naked tails. Fisher knew about rats. There were rats in some of the destroyed pods back in his birthing place — the Ark the mechanical man was talking about. The rats that encroached now were much larger, and their paws more like his own hands. A few of them rose up and walked on two legs. Don’t get bitten, Fisher thought. Infection and disease were very dangerous. They could lead to his death. Fisher was only a few hours old and could not afford to die. These thoughts kicked his heart into a rapid throb. His limbs coursed with blood and energy. He welcomed the sensation. It would help him fight. One of the rats darted around the mechanical man’s legs and leapt at Fisher. With a swing of his spear, Fisher sent it squealing through the air. But more rats were upon him. He hissed in pain as rat claws raked his shins. He thrust his spear down toward his attackers, but they were agile and managed to twist and squirm away from the point of his spear. “Run, Fisher,” said the mechanical man. Fisher didn’t need to be told twice. He turned and took off in a mad sprint, slipping on mud, scrambling over ruined spans of walls. But the rats were faster. He could hear their squeaks and the splash of paws in the wet earth. He had no choice but to turn and fight. Facing them, he bared his teeth and raised his spear. The rats bared their teeth in return. Theirs were as long as his fingers. I have stupid little teeth, thought Fisher. But he had something the rats didn’t: A tool. He rushed forward with his spear and jabbed at the rodents. They weren’t very impressed at first. The biggest of them squeaked, and in response the other rats surged. So, the big one was their pack leader. That was the one Fisher needed to kill first. He hurtled over a charging rat and drove his spear between the leader’s shoulders. The rat thrashed and convulsed on the point, its tail madly whipping around. With the rat impaled on the end of his spear, Fisher slammed it down, right into the middle of the pack. Now the rat was still, and Fisher felt like throwing up. He clenched his jaw and tried to ignore the sensation. There wasn’t room for anything but fighting and surviving. No distractions. No feelings. He braced himself, ready for the next wave of attacks. Instead, the rats fled, scurrying away into the surrounding ruins. Fisher thought of giving chase, because he was angry at them for attacking him and the fight was still in his blood. But his head prevailed. This was a time to be cautious, or even fearful. Fear was another kind of survival tool. Fear reminded Fisher how soft his flesh was, how easily he could fail to survive. Like blood from a wound, the urge to fight drained from his limbs and left behind exhaustion. His empty muscles burned. In all the hours since his birth he’d had nothing to eat. He needed food, or at least water. He remembered passing some ashy puddles. Maybe he could risk a few sips. A rat leaped off the pylon, straight for Fisher’s face with its grasping claws. But something knocked it out of the way: The mechanical man. Instead of clawing Fisher’s eyes, the rat tore at the mechanical man’s. The machine said nothing, silent except for smack of its plastic hands as it swatted at the rat and the brittle crack of its eye socket as the rat tore at it. Fisher swung his spear with a grunt and batted the rat off the mechanical man’s face. It arced through the air and landed in the mud, then scampered off with an angry squeal. Fisher gaped at the mechanical man. One of his eyes hung loose on wires. He stared at Fisher with his expressionless plastic face. Fisher got the feeling he was supposed to respond in some way, but he didn’t know how. “Let’s get out of here before the rats come back,” Fisher said. They walked together in the shadows, the machine creaking with every step. Next postThe Official Pottermore Video is Up, Be Prepared to Get Excited!